Aim: I want to take hex and ascii data (derived from a binary file using xxd) and use Objdump (or a suitable other tool that Linux comes with) to output the memory addresses / offsets, assembly code, and text data. Currently I can get the offsets and assembly code, but not text strings alongside. Should I need to use the -s switch? It is assumed here that Linux ELF32 binaries are being analyzed. Code and data such as strings are stored in separate parts of ELF binaries. To disassemble the parts containing code, use objdump -dj .text <binary_name>. To make this more clear, below are visualizations of the Linux utilities ls, cat, mkdir and mv (accomplished via binvis.io). The solid blue areas consist of ASCII string data (the .rodata section, for example), and the large blocks of blue, white, red and black mixed together are regions that consist of executable code (the .text section, for example). As we can see from these visualizations, these binaries are organized in a similar fashion. Each binary has discrete areas, or sections, which contain different information. We can also see here that there are multiple areas (i.e. sections) containing ASCII string data, not just one. 401b20 00e8bafe ffffbe87 944000bf 61944000  .........@..a.@. 401b40 102c4000 e8877800 00c64424 0f0048c7  .,@...x...D$..H. 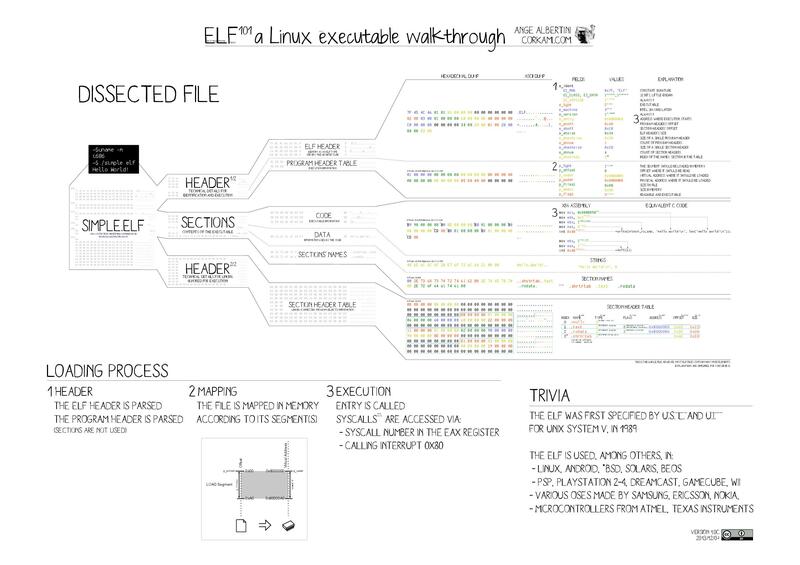 In ELF binaries, the .text section holds the executable instructions of the program. The bytes the instructions are composed of are being treated as ASCII in this hexdump, so there are meaningless sequences of characters being printed. objdump relies on an ELF binary's section headers to determine which sections of the binary contain code and which sections contain data. Only sections with instructions (.text, for example) should be disassembled using objdump.The -D argument to objdump will result in all sections of an ELF binary being disassembled, even non-code sections like .data and .rodata. This means that even if a section contained hardcoded strings (.dynstr, .shstrtab, .rodata, etc.) objdump would treat this data as instructions and dissasemble them accordingly. Furthermore, the arguments -b binary result in objdump treating the binary as a blob with a single section, obliterating any distinction between code and data within the binary, resulting in the entire contents of the binary being treated as code. Reference: the System V ABI section 4: "Object Files"
Not the answer you're looking for? Browse other questions tagged disassembly disassemblers binary objdump hexadecimal or ask your own question. How to include these exception handle symbols in x86 assembly code?